Views from the loch. : Paradise in all its glory! Paradise in all its glory! Photo 01 - Reinforced area to be filled with chopped strand! Yet again the date all Brown Trout anglers yearn the legal date for the opening of the Brown Trout season is almost upon us. The 15th March is a date etched into the minds of committed anglers. Rods have been checked rings inspected and fly lines inspected and cleaned. The fly box will have been inspected for rusting flies and any found ruthlessly discarded. Casts will be gathered ready for a mass execution there can be no survivors from the year past! Memories of the one that got away last year will come flooding back and that particular area of the loch will be included in the first assault. Many old haunts will be revisited with expectation, new areas of interest will be pencilled in and visited when time allows. The horizon will be scanned for rising fish and any spotted can expect to be bombarded by a torrent of iron and feathers! Brexit and other such tosh will be banished for the day! Where there was confusion and irritation there will be clarity of thought and contentment. Worldly worries will disappear albeit temporarily as the rugged atmosphere consumes us and we blend seamlessly with the loch! We will delight as the hooligans fly overhead with their distinct inimitable calls. Smiles will abound as the Grey Wagtails dance merrily on the bank filled with happiness on arriving back at the loch. We will stare in amazement as the deadly hunter the Osprey executes its attack on an unsuspecting prey fish. There will be many more individual thoughts and sights encountered by the angler as he nestles into the ambience of the loch for another season. However it will be a case of once more, once less, as our body clock ticks ever onwards relentlessly eating in to our allotted time! The need to savour the most the lochs can offer is intense and for many overpowering! To the average punter the 15th is just another day, but for the Brown Trout anglers on the lochs it will simply be paradise in all its glory! It will soon be time for our annual Wild Trout Competition to be held on St Mary’s loch. We are looking at Saturday the 8th of April as the date. This will be confirmed next week. Prizes will be – 1st prize a day autumn Salmon fishing on the upper Pavillion beat on the Tweed. The Westbrook cup for one year and membership of the club for a year and a Hardy fly line kindly donated by David Shotton. 2nd prize a bottle of spirits of your choice plus a selection of loch fly’s. 3rd prize will be a selection of loch fly’s suitable for use on the loch. More details will follow in the next few weeks. Our representation on the Tweed Commission. So far no nominations have been received for this position mentioned last week and I can’t say I am surprised the reputation of the Tweed Commission among regular Trout anglers is not good. We will hold off replying to the invitation until Thursday and if no nominations are forthcoming by then we will formally decline the invitation. Photo 02 - Reinforcing added! Progress is being made, it is however less rapid than we would like. 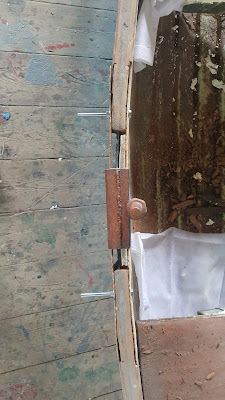 Frank and I spent some time trying to drill through two steel bars each an eighth of an inch thick and we managed two holes out of twelve required. The battery drills discharged quickly and our Titanium coated drill bits looked like they were made out of lead so hopeless were they! Well one side has the reinforcing plates fitted and do they make a difference! There is a rigidity never before seen on this boat pulling on the oars will actually translate into movement on the water, it's a heavy duty solution that should last for years! 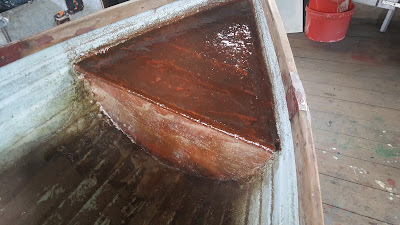 We also sealed the end flotation tanks with a couple of layers of heavy fibre glass matting once again joining the tanks to the boat sides repairing the previously inflicted damage. So it’s a heavy duty electric drill and a couple of Cobalt drill bits for next time! Further news on our competition! Content anglers and a competition!